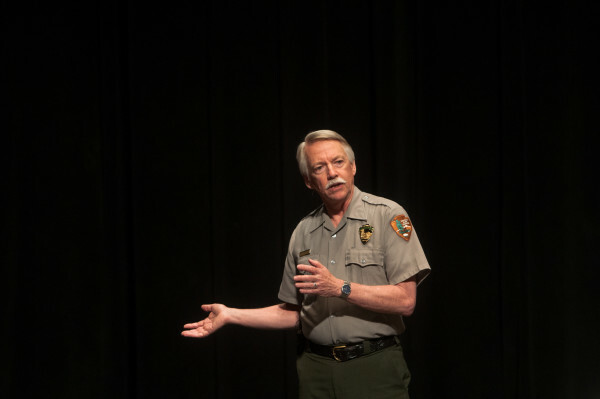 National Park Service Director Jonathan Jarvis speaks at the day's second public forum on a monument proposed by Roxanne Quimby's family for lands east of Baxter State Park at the Collins Center for the Arts on the University of Maine campus in Orono. 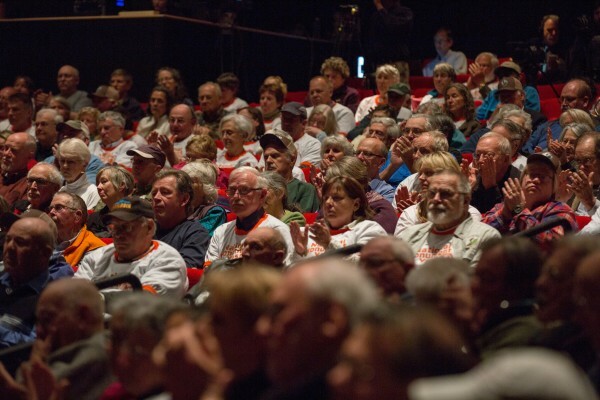 The audience of the day's second public forum on a monument proposed by Roxanne Quimby's family for lands east of Baxter State Park claps for a proponent of the project at the Collins Center for the Arts on the University of Maine campus in Orono. 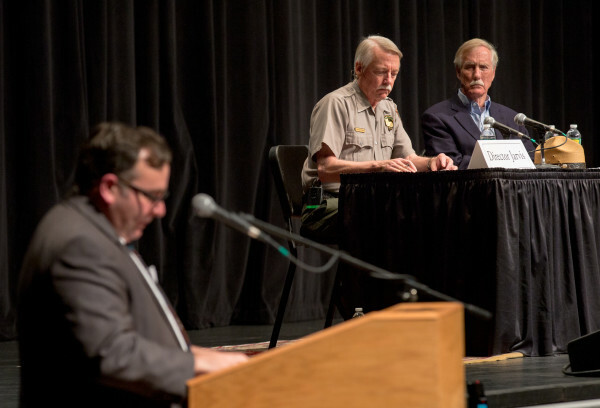 National Park Service Director Jonathan Jarvis and U.S. Sen. Angus King, I-Maine, listen to a LePage representative at the day's second public forum on a monument proposed by Roxanne Quimby's family for lands east of Baxter State Park at the Collins Center for the Arts on the University of Maine campus in Orono. Roger Ek of Lee speaks in opposition to a monument proposed by Roxanne Quimby's family for lands east of Baxter State Park at the day's second public forum on the subject at the Collins Center for the Arts on the University of Maine campus in Orono. 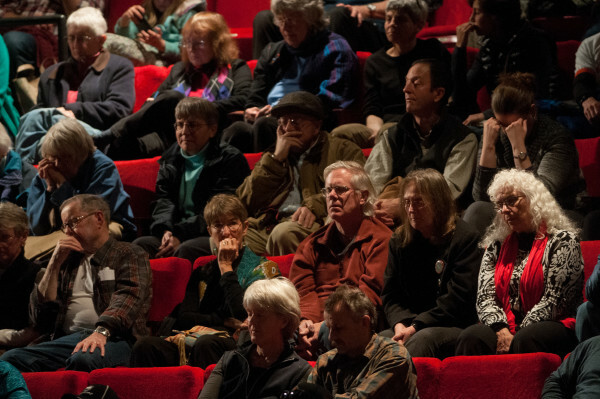 The audience of the day's second public forum on a monument proposed by Roxanne Quimby's family for lands east of Baxter State Park listens at the Collins Center for the Arts on the University of Maine campus in Orono. 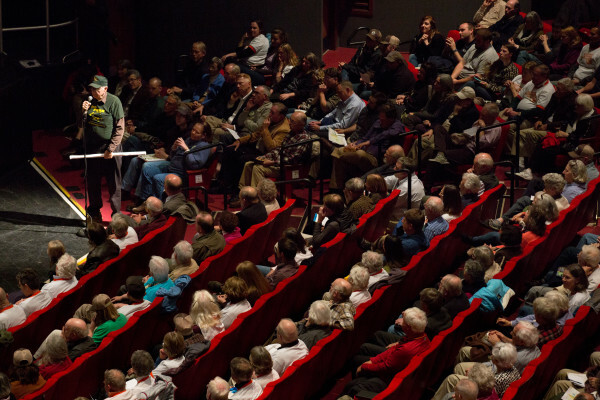 The audience of the day's second public forum on a monument proposed by Roxanne Quimby's family for lands east of Baxter State Park listens to National Park Service Director Jonathan Jarvis speak at the Collins Center for the Arts on the University of Maine campus in Orono. National Park Service Director Jonathan Jarvis listens to a LePage representative at the day's second public forum on a monument proposed by Roxanne Quimby's family for lands east of Baxter State Park at the Collins Center for the Arts on the University of Maine campus in Orono. 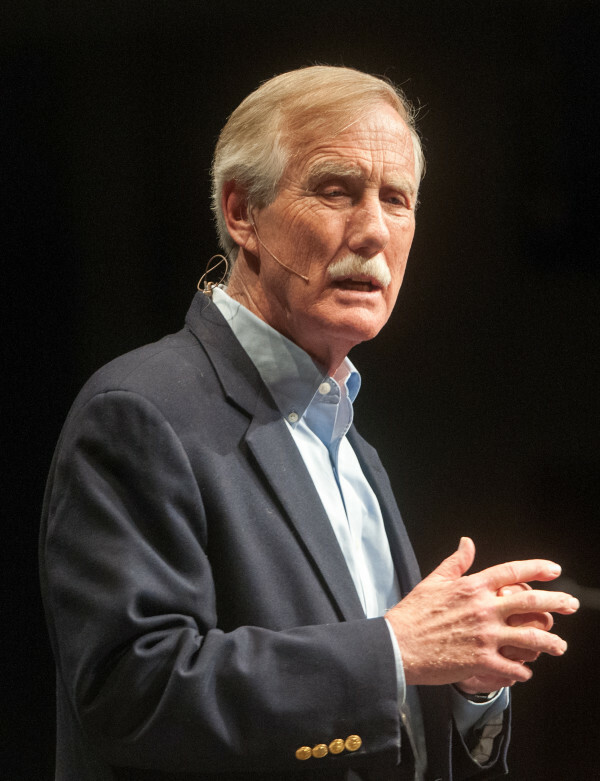 U.S. Sen. Angus King, I-Maine, speaks at the day's second public forum on a monument proposed by Roxanne Quimby's family for lands east of Baxter State Park at the Collins Center for the Arts on the University of Maine campus in Orono. 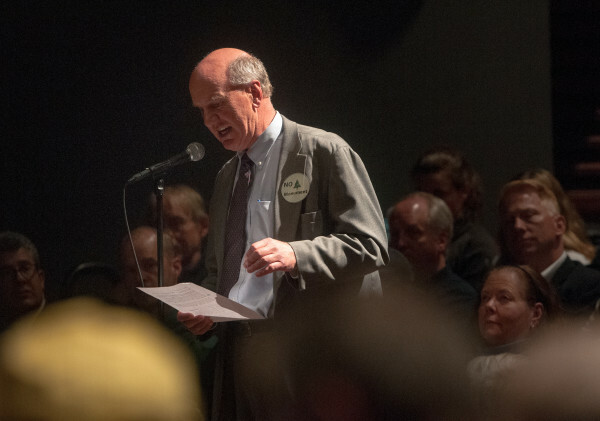 A candidate for district representative speaks vehemently against a monument proposed by Roxanne Quimby's family for lands east of Baxter State Park, saying the audience in attendance at a the day's second public forum at the Collins Center for the Arts on the University of Maine campus in Orono did not represent the views of people in towns like Medway and Millinocket. 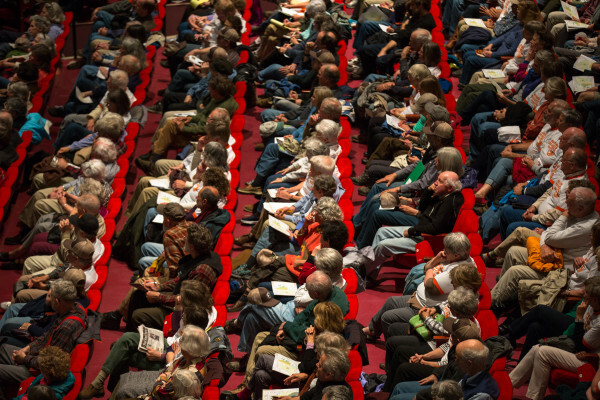 A large audience fills the Collins Center for the Arts from top to bottom for the day's second public forum on a monument proposed by Roxanne Quimby's family for lands east of Baxter State Park. National Park Service Director Jonathan B. Jarvis addresses the crowd at the Katahdin Region Higher Education Center in East Millinocket Monday. Jarvis is listening to Maine people's opinions on a proposed National Monument in the region. U.S. Sen. Angus King (left) listens. 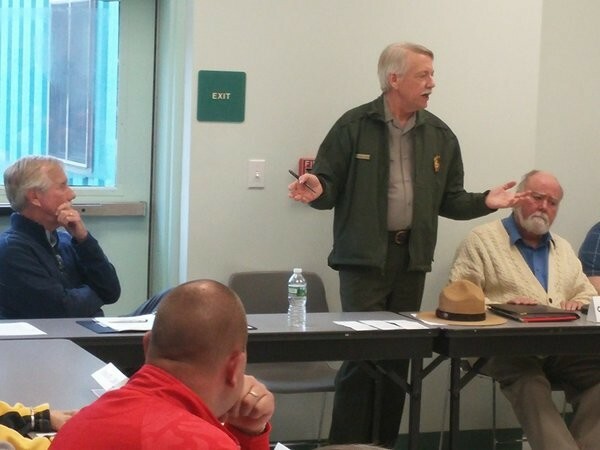 Local town officials prepare to discuss a proposed national monument in the Katahdin Region with National Park Service Director Jonathan B. Jarvis and U.S. Sen. Angus King on Monday in East Millinocket. 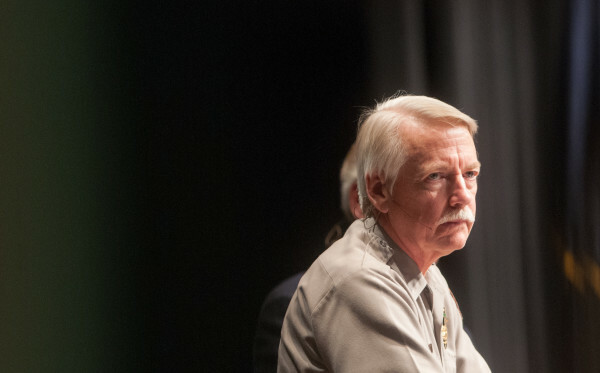 Audience members listen as National Park Service Director Jonathan B. Jarvis and U.S. Sen. Angus King meet with local town officials at the Katahdin Region Higher Education Center in East Millinocket on Monday. The discussion centered on a proposed national monument in the region. Glen Brand, chapter director of Sierra Club Maine, speaks to the media before boarding a chartered bus in Portland on Monday bound for Orono where National Park Service Director Jonathan B. Jarvis and U.S. Sen. Angus King listened to people on both sides of the debate over a proposed national monument east of Baxter State Park. 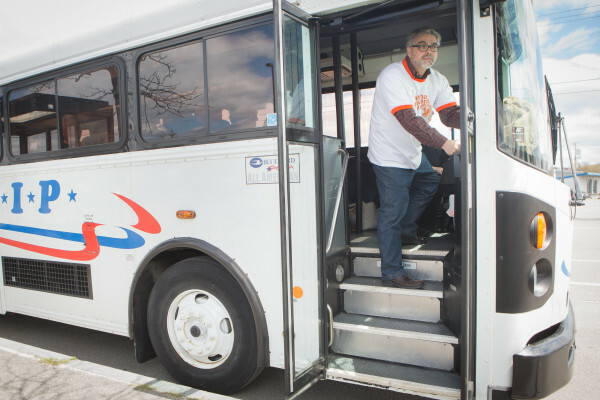 The bus carried about 40 people who supported the creation of the monument. 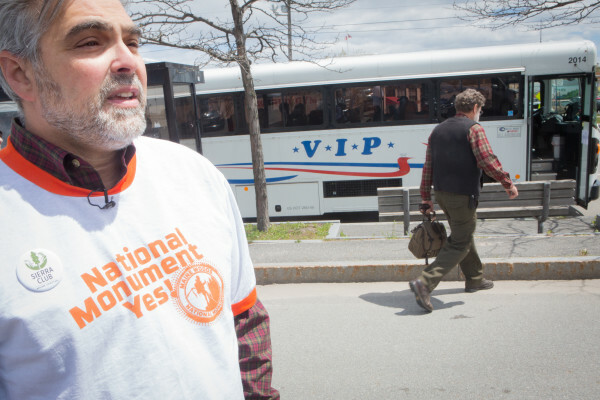 Glen Brand, chapter director of Sierra Club Maine, looks for stragglers before boarding a chartered bus in Portland on Monday bound for Orono where National Park Service Director Jonathan B. Jarvis and U.S. Sen. Angus King listened to people on both sides of the debate over a proposed national monument east of Baxter State Park. The bus carried about 40 people supporting the monument. 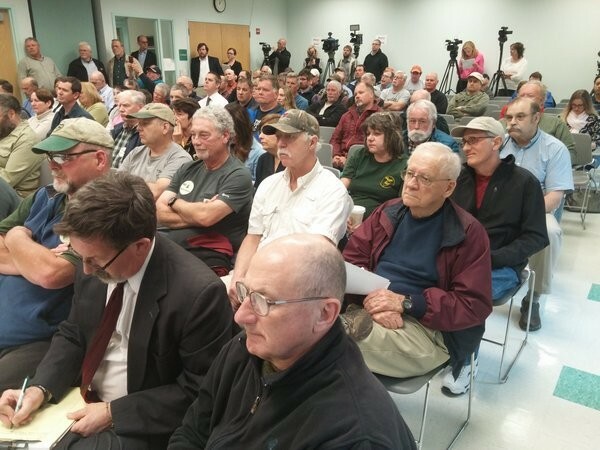 ORONO, Maine — A near capacity crowd of 1,400 people attended a forum on a proposed North Woods national monument on Monday at the University of Maine during which pro and con arguments followed one another in quick succession. 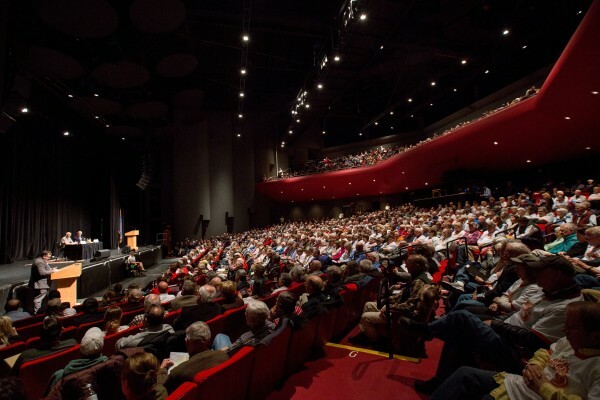 After a tense forum involving Katahdin region leaders in East Millinocket earlier in the day, where speakers were almost universally opposed to the proposal, the public meeting at UMaine’s Collins Center for the Arts showed the stark differences of opinion on the subject held by people around the state. Fans of the monument proposed by the family of entrepreneur Roxanne Quimby, some of whom rode buses from Portland sponsored by environmentalist groups, praised it as a tonic that would put lovely woods on an international stage, draw thousands of tourists and create more jobs in a Katahdin region that needs them. 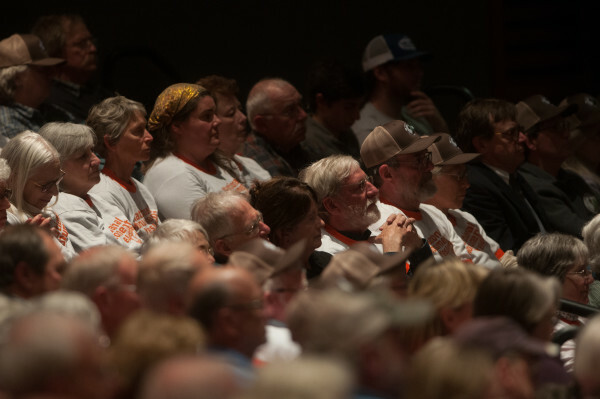 Opponents, including forest-products workers, decried it as an oversold boondoggle that would impose an unwanted and unresponsive federal control on the area. 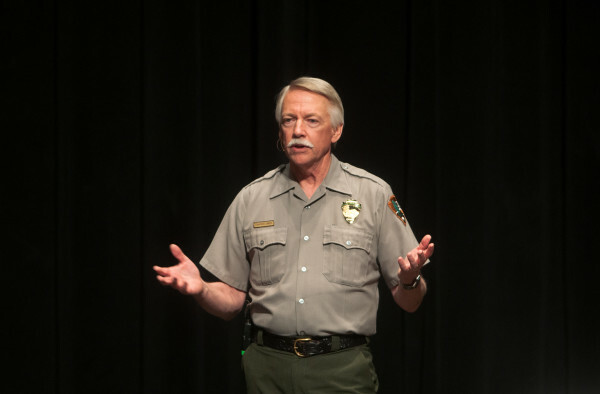 The UMaine forum was the second attended by National Park Service Director Jonathan Jarvis and U.S. Sen. Angus King, I-Maine. The first, at an East Millinocket higher education center, drew about 75 people. 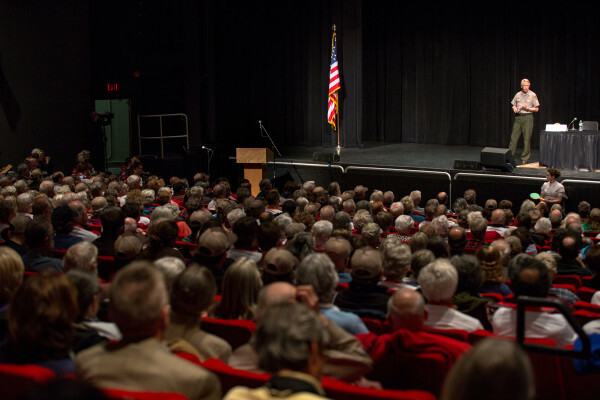 Jarvis told the UMaine audience that many entrepreneurs have donated land to the park service, but said that Quimby’s offer of a $20 million endowment and an additional $20 million in cash to be raised by her was completely unprecedented. The park service, he said, has no interest in expanding the proposed monument land beyond its present boundaries and would not — could not — use eminent domain powers to seize adjoining land. Lucas St. Clair, Quimby’s son and a leading proponent of the monument, warned residents in the latter forum that a national monument “isn’t a silver bullet — no one thing is. But a major recreational attraction in the interior of northern Maine can be part of a new economic foundation that will create opportunities for new businesses to start and existing businesses to grow. 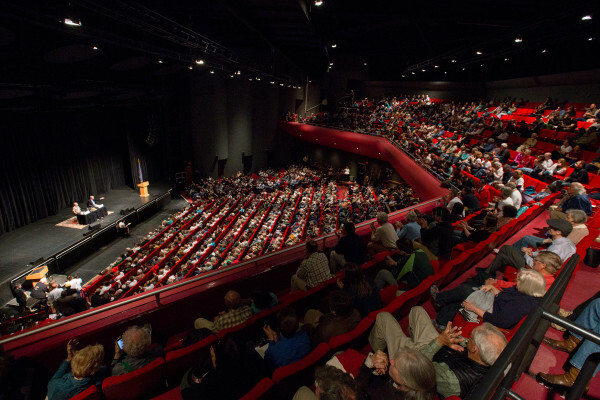 “All told, the national monument and endowment represent a $100 million investment in the Katahdin region and in the state,” said St. Clair, who made remarks before the floor was opened to questions at the UMaine venue. The questions came steadily from people who lined up at microphones on both sides of the auditorium, with speakers alternating pro and con with questions or comments. “It is printing money. It is bringing economic development, jobs and money to this region,” Faircloth said. Sportsman’s Alliance of Maine wildlife biologist Gerry Lavigne said that more than 90 percent of his organization’s members have opposed the monument designation proposal. Others said that the decimation of the state’s paper mills — five closed in the last six years — made a change in Maine’s economic focus inevitable. Parker Lumber Co. co-owner Brian Parker said that a national park would have a negative impact on an industry that produces $7.5 billion in revenue for the state annually, and would hurt his mill, which draws wood from the forests within a 150-mile radius of the Quimby lands. Steve Brook, spokesman for the Maine Council of Trout Unlimited, said the monument would help preserve some of the best fishing waters of the Penobscot, Seboeis and Piscataquis rivers, among others. Maine Snowmobile Association Executive Director Bob Meyers said the monument effort represented “an admission of [the] failure” of the national park campaign that preceded it. “Maine people know that this is not about conservation. It is about control and buying a legacy,” Meyers said. Former Millinocket Town Councilor Avern Danforth took the opposite view. “We need the branding of a national monument. You give us that opportunity, and we will make a new beginning,” Danforth said. “We were polite, we were respectful,” said King, who has been a catalyst in the debate and set up the forums. Earlier, at the East Millinocket event, Millinocket Town Councilor Michael Madore said that as a member of the National Park Foundation, Quimby had “a conflict of influence” over state and local leaders who have overwhelmingly opposed her proposal for eight years because she and her son have greater access to park leaders and President Barack Obama than they do. 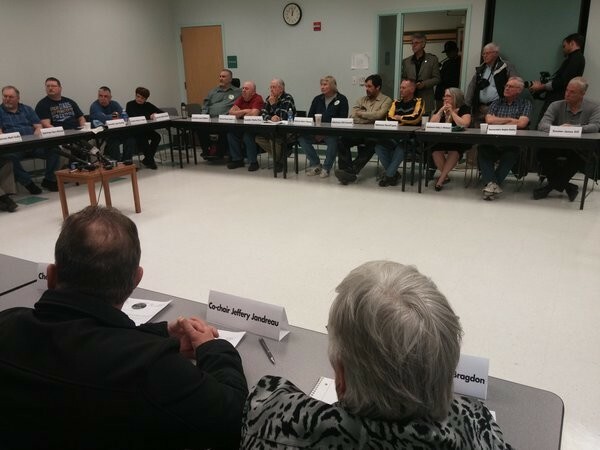 “It is tiring, this perpetual cycle of saying no,” Madore said during the 2½-hour meeting at Katahdin Region Higher Education Center in East Millinocket. Jarvis met at the education center with selectmen and town councilors from East Millinocket, Medway, Millinocket, Mount Chase, Patten, Sherman and Stacyville, who were themselves gathered in the same room for the first time in decades. Out of the approximately 75 people there, two spoke in favor of the monument. The meeting was cordial but often tense. One man, a proposal opponent, was ejected for using an obscenity. Patten Board of Selectmen Chairman Richard Schmidt III said that while Patten residents had voted against the proposal at an April referendum, “a good core” of local businesses supported the plan, which he said was a great opportunity. “I believe we have the ability to channel this river in a direction that can serve us best,” Schmidt said. Another man in the audience said that he represented “a silent majority” who supported the Quimby plan. The forum followed a breakfast with Jarvis and the Katahdin Area Chamber of Commerce at River Driver’s restaurant just north of Millinocket. No one can stop the president from signing an executive order turning Quimby’s land into a monument, said King, who earlier this year voted against a measure that would have moderated the president’s authority to designate national monuments. Obama has until Jan. 19, 2017, the very last day of his administration, to issue an executive order creating a national monument. Such monuments often become national parks later. Obama, King said, sent Jarvis to Maine to gauge local response to the Quimby proposal and advise him. Jarvis said he appreciated the concerns residents have. Correction: A previous version of this story misspelled Gerry Lavigne’s name.